Now that the weather is getting colder, I’m relying on my crock pot more and more to provide meals. I love how I can just throw in ingredients, go to work and then come home to dinner! 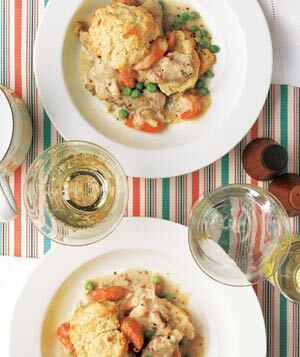 Last week, I revisited one of my favorite cold weather recipes, chicken and biscuits a la crock pot. Like pretty much every recipe I put on the blog, this one is pretty simple and won’t take you much time to throw together. The time comes in the cooking aspect, but do it overnight or while you are at work and you won’t even notice! Throw the celery, onion and flour into the crock pot. Season the chicken with salt and pepper and place on top of the veggies. Pour the chicken broth and wine over the chicken and cook on low for 5-6 hours. When you have 30 minutes left of cooking time, make your biscuits. You can try my biscuit recipe or use a store bought version to save time if you’d like. While the biscuits are cooking, pour in your heavy cream and frozen veggies. Add a hint more salt, if you like. Continue cooking for about 15 more minutes. Serve in a bowl, using the biscuits to sop up all the deliciousness! Enjoy! What’s your favorite crock pot recipe? It is REALLY tasty — highly recommend it! That chicken looks so yummy. I love my crockpots, yes I have more than 1! When I was working it was the easiest way to make up a good meal to come home to and cut back on take-out. I prefer chicken thighs too, they’re just tastier. I have so many recipes for the slowcooker but one of my favorites has to be beef stew with a red wine gravy and I love that I can buy a cheaper cut of meat that doesn’t get tough or stringy when I slow cook it. This sounds SO yummy! I am always on the hunt for new crockpot recipes!